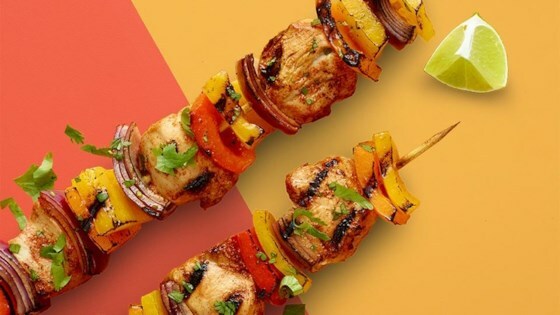 "Inspired by the flavors of Mexico, these skewers with zesty marinated chicken, colorful bell peppers, and onions cook quickly on the grill for an easy family favorite." Mix juices, oil and spices in large plastic food storage bag. Add chicken cubes; seal bag. Massage bag to coat chicken. Refrigerate 4 hours or overnight to marinate. Heat grill. Thread chicken, onion and bell peppers onto skewers. Grill about 10 minutes until chicken is cooked through, turning as needed for even browning. Serve with squeeze of fresh lime and garnish with cilantro. This 600-calorie meal is full of tropical and Asian-infused delights. TIP: *Soak wooden skewers in water 30 minutes before adding food to reduce charring. Lots of flavor! I will be making this recipe again. I made the Chicken Fajita Kabobs with the Arroz Rojo (Mexican Red Rice) recipe I also found on allrecipes.com.